These stuffed red peppers are simple, using only a handful of ingredients and a few minutes of hands on time. The end result is bold in flavor, with creamy, cheesy provolone, slightly acidic artichoke hearts, and a hint of heat from the green pepper sauce. To create a hearty dinner, serve this over polenta or rice. This would also make a nice side accompanying chicken or pork. I’m always happy when I can coax a lot of flavor from only a few ingredients and very little time – especially so where the dish is a great candidate to freeze. Simple freeze a single pepper it in a snug-fitting Tupperware, and you can remove it the night before to the refrigerator so it is defrosted by lunch time the next day. Pop it in the microwave and you have a delicious main component of a lunch. Spray a casserole dish with non-stick cooking spray. Add the peppers and spray to coat with non-stick spray. Place in oven and roast, turning once or twice, about 20 minutes until slightly tender but not fully roasted. Set aside to let cool, but leave the oven on. Mix together artichoke hearts, provolone, mayonnaise, pepper sauce, garlic powder, salt, and pepper until thoroughly combined. 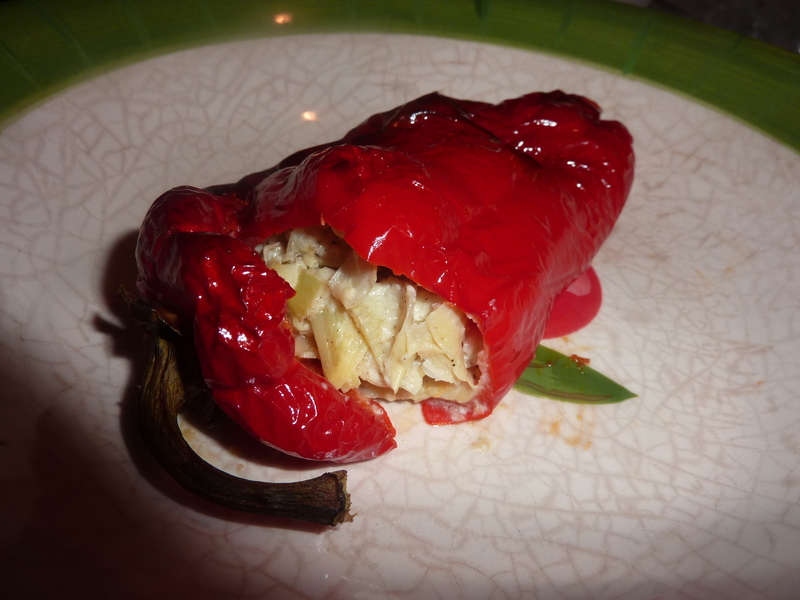 Once peppers are cool enough to handle, cut through 3/4 of the top to create a “flap.” Reach in and remove seeds. Using a spoon (or your hands) stuff the filling into the peppers, leaving about 1/2″ at the top. Return to the casserole dish, closing the top “flap” of the peppers. Bake 30-40 minutes until peppers are lightly charred and the filling is heated through. Serve immediately.